New York City, 1899. Jack Kelly and his ragtag team of newsboys make a meager living selling newspapers on the city streets. But when the prices of “papes” are hiked and the newsies are hung out to dry, there is nothing left to do but “open the gates and seize the day!” Led by charismatic Jack and independent, young newspaper reporter Katherine Plummer, the Newsies form a union and organize a strike against the greedy publisher of the New York World. Can a group of idealistic newsboys win against a foe as powerful as acclaimed publisher Joseph Pulitzer? 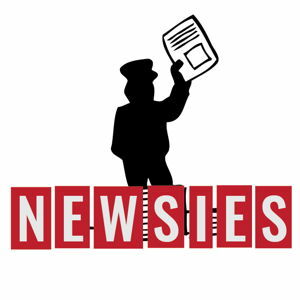 Inspired by the true story of the 1899 Newsboys Strike, Newsies is an ebullient, joyful, and entertaining musical capturing the strength that young people have when they join together and stand up against injustice. With a funny, poignant book by Harvey Feirstein and stunning music by Alan Menken and Jack Feldman -- including the show-stopping Seize the Day, power ballad “Santa Fe” and lovely new songs like Katherine’s “Watch What Happens -- Newsies is a classic with the power to inspire.